Recently, some transitory Presidential spokes-guy declared that there was a special place in hell for the Prime Minister of Canada; he probably didn’t mean just for Trudeau, but for anyone who had the temerity to irritate Donald Trump. As conceptions of hell go, it doesn’t sound all that undesirable a place, actually; you could certainly be in much worse company. Perhaps there’s a counterpart in heaven for certain kinds of above-and-beyond virtue, too – for people who venture to the MCG in bone-filleting cold, when wild winds and sweeping rains lash the ground. Depending on your viewpoint, you might call that special paradisal place the Strength of Character Salon, or maybe Cretins’ Corner. If you’re the kind of person who does that kind of thing, or who actually did it last Sunday for the Geelong-Richmond game, you surely deserve a bit of recognition. A lot of people stayed away on Sunday, and are thereby ineligible for celestial credit. Thirty thousand, probably, preferred the couch and Fox Footy with the heating on high. Hard to understand how anyone could make that call. I may be biased – I sometimes am in football matters. But it seems to me that my fellow Geelong supporters were particularly entitled to some brownie points for turning up: we were facing not just the icy blast and the awkwardness of another Sunday twilight fixture, but Richmond. Reigning premiers, winners of seventeen straight at the ground, and the team that whipped Geelong in a particularly horrible semi-final just nine months before. Our notional ‘home game’ didn’t confer any advantage that I could see. And, while Geelong slowly chips away at its list of walking wounded, the Tigers seem remarkably good at getting close to their best side on the park. Bachar Houli, who maybe should have a Norm Smith Medal in his sock drawer, is a loss of course, and the late withdrawal of Astbury was handy; but Richmond remains a formidably settled side, playing a confident game-style that looks based on everyone knowing the plan, and each other, very well. Geelong’s version of a work-in-progress sometimes looks like making-it-up-as-you-go, and when in doubt bomb-it-long-to-Tom and his several guards. So, points for turning up, for Cats fans especially. The Tigers got the win, again, and that makes their trip home in wintry bleakness more Balmey (and he’s another significant win they’ve had over us). To lose the game as well as a fair bit of your circulation warrants a ten percent loading in the virtue-scales, at least. But, weirdly, I’m glad I was there. There were immediate rewards in seeing the work-in-progress having an indisputable crack in something approaching a finals atmosphere, in watching the Selwood/Ablett/Dangerfield/Duncan/Kelly Geelong midfield winning the clearances as it rarely does but on paper mostly should, in noting whose skills stand up against the best defensive outfit in the competition and whose don’t, and in daring to dream what might happen at the rematch in just six weeks’ time. And the great reward of watching a game from the icy heights of Q46 rather than the couch is that you can see a game unfolding before you that is being played not only where the ball is, but in a lot of places where it isn’t. On television the informative wide-shot is mostly confined to the view from the goal-square for the kick-in, where you can see the attempts of one team to create space and of the other to close it down. But that’s one of the game’s freeze-frame stock-taking points, and that kind of ‘structuring up’ (as the coaches call it) or guarding grass (as it seems to the people on my side of the fence) occurs when nothing else is going on. From Q46, though, you can see what the cameras don’t show: what is happening off the ball while the game is in motion elsewhere. And you can see what, as well as hunger, manic forward pressure and a smattering of Dusty, brought the Tigers their premiership. At one point, they had the ball in their forward 50, where it seemed the entire Geelong team was desperately trying to cover options, to block and to smother and hang in there. The only players outside the fifty metre arc were five Richmond players. Yes, five. They were spaced perfectly at a distance of maybe ten or fifteen metres on the defensive side of the zone. It was so precise in its symmetry that if they hadn’t been wearing yellow-and-black you might even have called it beautiful. Certainly these sentinels looked much more serene than their thirteen team-mates and eighteen opponents who were part of the extended scrimmage around the ball. It was ruthlessly functional as well as aesthetically pleasing. Geelong’s weight of numbers in the defensive fifty meant they managed to clear the ball on a number of occasions, but when that curved wall was set the clearing kicks tended to go straight to one of those five, and an uncontested possession created another entry. If Geelong managed to get the ball over the wall, the defenders had a ten metre start in the familiar foot-race into the deserted forward fifty at the other end. For the Cats, forward pressure means locking the ball in attack, creating stoppages, frustrating attempts to run it out. For the Tigers it means this, too; but it also means ensuring that if the ball gets out it can be sent straight back in. And five more bodies to guard the exits means five fewer bodies to clog up the forward line. So I came away with an enhanced appreciation of the canniness of the Richmond coaching staff, and of the sustained discipline of the players who enact the game-plan. All sides probably have their variants of it, in principle or aspiration; but right now nobody does it better. And still there was only a point in it at three-quarter time, and three goals at the end. So I came away, too, with a sense that we’re getting closer to the benchmark, and might even have the weapons to make those well-laid plans gang a-gley – if not in six weeks’ time, then maybe in September. 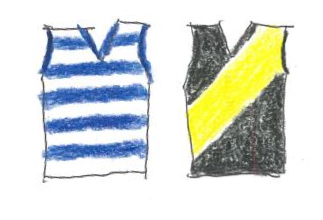 In last year’s finals, Richmond bullied (and eventually bulldozed) Geelong. On this icy Sunday evening, they threatened at several times to kick sand in the faces of the Geelong players; but this time they kicked back. That’s the hopeless devotee’s real compensation for all those drenchings in the stands and shellackings on the field, in the end. The hope of reward – not in some special place in heaven, but in September at the flaming MCG, where your team just has to find some way to win. I was there too Peter. It s was very cold. I’m very happy to pick up celestial credits where ever I can. They are getting harder and harder to get. As a Cats man I too left the ground thinking that we’ve made up a bit of ground on the Tigers. But September is the big stage and will be the main Test, if we meet them there (have to make it first!). Some of our young blokes were good but their kicking for goal demonstrated a bit of mental frailty. Beautiful and magisterial Peter. I enjoyed your observations and agree that one of the rewards at the game is to see what’s happening beyond the immediate vicinity of the ball. This peripheral action is, for me, a key attraction. Yes, I’m with you. .. a pergatory bypass should be the reward… I just did a small bit of the ‘way’ in Spain…… where pilgrims get their credentials stamped with each leg of the journey .. some redemptive theory for pilgrims way back. So, I see scope for your desire to earn weather points in return for a seat to watch your team at the granny. It would have to be a collective force, though. I wasn’t there and I despite the weather I wished I had been. I feel your pain Peter. Headed out of Perth after the pain of Thursday night’s epic fail by my Eagles and the rude intrusion of Perth’s annual month of “winter”. Up here in Broome we “southerners” were even reduced to wearing jumpers at the Mangrove Hotel last night. I may be gone a little while. Love the hesitantly optimistic tone of your piece. No man ever committed suicide with a weanling in the paddock. Good stuff, but it raises the question in my small and enfeebled brain as to why coaches permit the opposition to have 5 blokes standing in “the wall” just outside the 50 zone? Why have 18 v 13 inside? Why not tell 5 blokes to go and stand next to the 5 opposition outside “the wall”? How hard can it be?